[Editor’s Note: Hurricane Katrina was one the deadliest hurricanes in the history of the United States. With a storm surge of twenty feet tall, it was hard not to find the storm’s wrath. 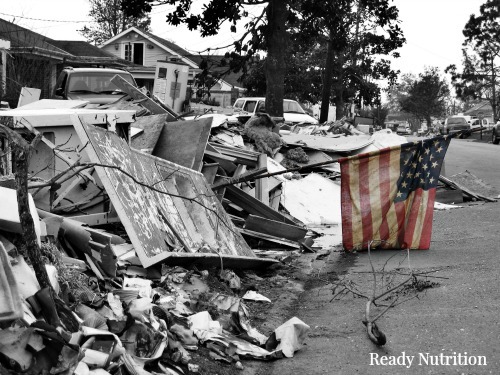 1,833 individuals lost their lives from the storm and countless wounded. Day after day passed by after the hurricane: the days were scorching, and I knew our home had to be as hot as a furnace. We had left out copious amounts of water and food for the cats, but the house was sealed up with no true ventilation. The loss of the power supply had left no air conditioning for them in a closed up house in the middle of the summer. They might be trapped and injured, or dead. There was no way of knowing. Finally at about the sixth day, the floodwaters subsided, and it was going to be permitted for those with hospital badges and bracelets (I had one) to leave temporarily to return home and ascertain the damage, as well as retrieve any articles. This respite would be permitted only for a short time. My mother-in-law would stay in the hospital. I made a plan complete with map and sketch and briefed my wife on it. We downloaded everything from the van into the car, which was in the garage. We planned on retrieving the cats if they lived and grabbing essentials if the house was intact. Most of the hospital employees did not venture forth. I drove the van, BDU top on, wearing a pair of cargoes and black jungle boots with my pistol holstered and concealed; my rifle was locked and loaded between us. We would leave the hospital and head for the main boulevard heading west and stay on it until we needed to veer off onto our turnoff street. Trees and power lines were down everywhere. Telephone poles had been snapped in half akin to matchsticks, and we drove slowly: this was to be cautious, for we were on our own in every sense of the word. Fifty percent of the local police force had either evacuated or left their posts, and the remainder was worked to their limits with no time to defend the local populace (let alone us). Debris of metal and vegetation littered the streets everywhere, and in some places I drove on lawns or on the shoulder to go around fallen trees and twisted metal. Buildings were destroyed, ripped to shreds. Prominent restaurants, car dealerships, gas stations, all had been demolished or leveled. The windows were broken (or broken into) and roofs ripped off on every other building. No traffic lights or signals, no power anywhere. We turned down a side street and were going to make our way along when I noticed two vehicles about 200 meters to our front pull off to the right side of the road. Four men exited the vehicles, one sporting a rifle or shotgun, and the road to their front was half blocked off on the left side. Their vehicles plugged the gap. They turned and looked at us. It was a cul-de-sac: I stopped the van and backed up, did a fishtail, and turned the van around 180 degrees. “It was either a trap or could have been one,” I told my wife, and we both gave thanks that we had not fallen into it. I ran a box, driving two streets up and then hanging a right and driving west for about five hundred meters, then hanging another right. Two streets down, and I turned left, placing us on the original road where we had been forced to turn around. There was no sign of any activity behind us, and the road was fairly clear. We proceeded to the main boulevard and kept a close eye out for any blockades. The drug-gangs and street thugs were blocking the roads, and when cars stopped they would remove the occupants and steal the vehicle. Sometimes worse things would happen. They had also obtained police uniforms and acted as “checkpoints,” and beaten the unsuspecting motorists to death. From the road, our building appeared intact. We proceeded to the intersection and turned a left. I parked tactically, backing the vehicle up on the side next to the condo office. Locking the van, I grabbed my rifle and led the way. My wife had the keys, and we went to the front door. Both of us had flashlights. My wife was to stay in constant physical contact with me and behind me, never interfering with my line of sight or fire. I would clear each room after we were in the house and the door was closed and secured behind us, and when all the rooms of the house were cleared we would search for the cats. The cat carriers were in the house, in the living room. The entire bottom floor (the 1st floor below our unit) had been flooded out. There was a fallen tree in the pool, the diameter at least three feet. The tree in one section and in several other sections had leveled the wrought-iron gate. Strange people were walking around the property, people we had not seen before. I was armed: they did not disturb us. The water of the pool was foul and blackened, and a stench arose from it. Flies and mosquitoes were everywhere: their buzzing was incredible. We made our way up the stairs cautiously. Two residents of our building (we knew they lived there but did not know them) were in the end unit, and they watched us. All of the units were damaged except the exterior of ours: the plywood was intact where I had covered the living room windows, and the door was intact. We opened it. It was stuck, but it opened. I cleared the house. The cats were thin and shocked (they had been in darkness for a week), but they were alive! My wife quickly moved food, litter boxes, and the animals to the van while I pulled security. When we finished we returned to secure the house. Then, a man started yelling from across the parking lot toward my wife, calling her! He had not called her by name, but he was trying to get her attention, and he looked as if he was nuts: stark, raving mad. My wife and I did not know him. He was a tall black man about my age, and he was now running toward us. My wife was scared. “Get behind me,” I told her, hoping I wouldn’t have to fight. She complied, and the man came closer to the bottom of the stairs. I ensured a round was in the rifle’s chamber then held it ready, although I did not point it at him. “I won’t hurt you. I just want to talk to her, is all,” he said, pointing to my wife, and I nodded in the negative. “Uh-uh. You talk to me, not her. What do you need?” I asked quietly, and he took a step forward. Then he saw the rifle. The man stopped without my pointing the weapon at him. My wife was against my back, trembling. “That’s fine. What’s your name?” I asked, breathing a slight sigh of relief. He told us his information, and my wife promised to convey it if she saw the woman. The man left. Others had seen what went on, but there was no incident. There were several people on the corner of the pool, roasting some kind of meat on the pool’s concrete walkway. One man had a long beard, and I had never seen him before. Several mounds jutted from the grass; they were the size and shape of human bodies. Later we learned that they were. In the back by the dumpsters, mountains of garbage had been piled up. We heard millions of flies buzzing, and the wriggling of maggots could be heard, along with the sight of them. People were starting to emerge, very few that we knew. Several men were staring hard at the van: not a car was running anywhere. They had seen my rifle, though, and did not try anything. “Let’s go,” I told my wife, and she nodded. I placed the rifle between our seats. Just then, a Jefferson Parish police officer could be seen talking to two people at the entranceway to our complex’s parking area. A man and woman were talking to him, angrily pointing at us and telling the policeman that we had a weapon. They were making it sound as if we had menaced people. The officer and I met eyes, and he saw my wife and the three cats. Then he looked at the Special Forces Tab and saw the Arrowhead on my left shoulder. He smiled and tapped his left shoulder. “1-0-1,” he said, meaning he had been in the 101st Airborne Division. He grinned and gave me a thumbs-up. “Airborne!” I said, returning the grin and I saluted him. We left without any further incident and made it back to the safety of the hospital. As soon as we were able we packed it all up and left the city completely. Ever since then, we have (bit by bit) prepared just as most of the readers here. That was our story, and I feel very honored to be able to share it with all of you. Have a great day! Wow, I have really enjoyed reading this. I am sure for many of us, watching what happened in this hurricane was the wake up call. This is what confuses me, I just can’t see our suburban community going this rogue… this out of control. Is this normally a rough gang infested area? Or was it the desperation?